The next big Windows 10 OS update, dubbed “The Creators Update” is rolling out. What does it offer and how do you get it if you haven’t been notified yet. Microsoft’s new operating system update to Windows 10 started rolling out to the public on April 11th 2017 as announced. The update is designed to bring out the creator in you. In relation to Microsoft’s mission statement, it’s more like Microsoft is empowering each Windows user to achieve more by creating. Microsoft is currently trickling out the update to users and advises you wait for it to hit your PC. It might take a while for this to happen, just as in the case of the anniversary update. This is to avoid and help solve some of the issues that come up during the update process. Alternatively if you have been an active Windows Insider then you’ve been using this update for sometime now. You can opt out now and be okay or better stay in and see what more will come in the next update as it continues. If you believe you are an IT pro, have an extra device to trial or can handle technical issues that come up during the upgrade, then you can trigger the Windows 10 creators update now using the Microsoft Update Assistant. This is also a free upgrade if you purchased a new Windows 10 PC or upgraded from a Windows 7 or 8 PC when Microsoft allowed it. If not you’ll have to purchase it like as usual. I’m not sure if you can still validate it with your Windows 7 or 8 activation code if you are now stepping up to Windows 10. You can try and let us know how that works out for you, maybe Microsoft still has that door opened? The Windows 10 Creators Update comes with a lot of tweaks to the feel and look of the OS. It also comes with some very notable features as well. Don’t forget that with the Windows Insider program, Microsoft is listening to how users want the OS to feel in helping them stay more productive. It also brings some under the hood improvements to performance, battery life, security, etc. Paint goes 3D, Augmented and Virtual Reality (AR/VR) with Windows Mixed Reality, Game ? stream mode and Xbox ? play anywhere, Cortana gets better and makes you more productive, plus others are some of the new features in the update. I’ll try and detail out a summary. Let your imagination take shape and find your inspiration. 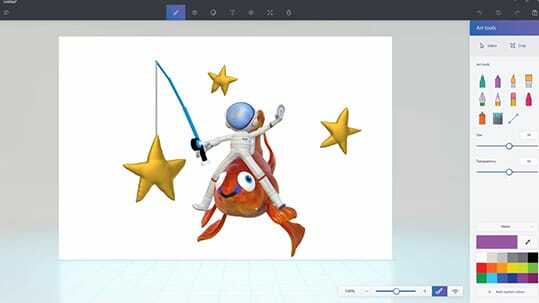 – In Paint 3D it’s a snap to create 3D objects from scratch or modify someone else’s creation. Easily change color, texture or turn a 2D picture into a 3D object with a click. When you’re ready, share to your favorite social sites or the Remix 3D community. Immerse yourself in a new reality. – Windows Mixed Reality combines the thrill of virtual reality with the power to engage with and personalize your virtual surroundings. Stay tuned as we work with our partners to bring amazing and affordable experiences to market. Cortana remembers so you don’t have to. – Cortana integrates with other apps within Windows to help you stay on track. Create, add to and access your Wunderlist lists from Cortana with voice or text. Built-in broadcast gaming. – Watch and play alongside game broadcasters with Beam, the interactive livestreaming platform where you can interact with streamers in real-time. Books now in Windows Store. – With Books in Windows Store and Microsoft Edge discover and read e-books from your favorite authors across the genres you love. Books is available across all Windows 10 devices. Sleep better with blue light reduction. – Now reduce the blue light emitted from your screen at night – get your brain ready to power down for a good night’s sleep. Say goodbye to tab chaos. – Microsoft Edge now allows review, grouping and saving web page tabs. Quickly find, manage and open tabs you set aside without leaving the page you’re on. The quickest way to set ideas in motion. – Quickly access the Windows Ink Workspace to use Sticky Notes, Sketchpad, and Screen Sketch. Naturally create, capture and edit ideas at the speed of thought within Office. Windows Hello, you are the password. – Windows Hello is the password-free sign-in that gives you the fastest, most secure way to unlock your Windows devices. The best Windows ever for gaming. – Play great new Xbox games on Windows 10 in native 4K resolution. Stay connected to your gaming community with the Xbox app. And play where you want with in-home streaming and Xbox Play Anywhere. Most comprehensive security. – As the most secure Windows ever built, Windows 10 delivers comprehensive protection – including anti-virus, firewall, Windows Defender and anti-phishing technologies – all delivered built-in at no extra cost to you. So what do you think? Is your PC seeing the upgrade notification yet? Tell us what you think about the Windows 10 creators update in the comments. Share your experience thus far with us. Get the Microsoft Update Assistant for PC here. Catch up on all the new features in the Windows 10 Creators Update here.